Personal statement writing may just be one of the most difficult things you’ll do in your academic career. Surprisingly. It’s your one chance to show the admissions staff that you’re perfect for their program, and your one chance to tell them about yourself and impress them. And a lot of people don’t pay that much attention to that since people are used to thinking that amazing grades and flawless record list can open any door for them. But it’s not like that at all. Plus admission requirements in different countries for study abroad personal statement essay may differ a lot and you can never guess what’s gonna be needed of you. So what is the formula of a successful personal statement? Let’s have a look at some of the most crucial parts of your winning statement. Since it’s so crucial to write a statement that will stand out and highlight all your good sides, we’ve put together a list of tips to help you make yours great. Take heed of these tips and you will find yourself with a great personal statement with less effort. You’ll find it easier than you thought! Avoid standard phrases: ‘Passion’ is overused. Show, don’t tell, your reader that you are passionate. 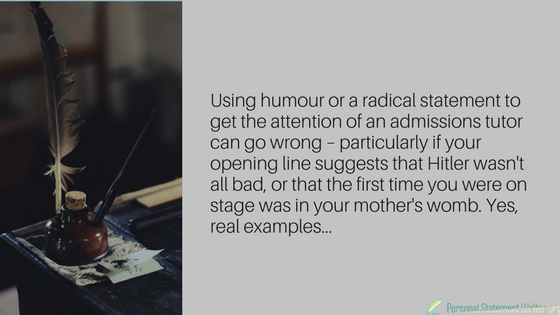 Likewise, too many personal statements start out with ‘Since I was a child…’. You want to stand out, and to stand out, you need to be unique. Don’t drown your originality in tired clichés. Leave out what’s not important: The goal of this statement should be creating a streamlined narrative of your academic life that shows why you want to study what you do and why you’re qualified for it. Stuff that doesn’t contribute to that goal should be discarded. Form a story: However, remember that keyword: ‘narrative’. Don’t just drop a bunch of facts in there! When writing a personal statement, you want to tell a story about yourself. Connect the facts of your past to the goals of the present. Show growth: When constructing your story, show that you learned from your mistakes and have grown over the years into a more mature, more responsible, and more knowledgeable person. Take this opportunity to explain any gaps or issues in your academic career. Don’t forget to proofread: You want to present a polished, final personal statement, not a rough draft. So have someone look over it before you turn it in. That way you’ll be assured that it’s smooth and error-free. During the writing a strong personal statement, you should be able to highlight your strengths without appearing arrogant or cocky. Do not include a lot of details or list that will bore your readers. Remember that your personal statement is your application essay. Although you can make it creative, it should still look like a formal application letter. Even great writers need a little help. Our professional services can give you that. We have a staff who can help you to create a better personal statement no matter your level of expertise. Whether you’re just starting out, or nearly finished, we’re confident that we can make you stronger as a writer and a candidate. 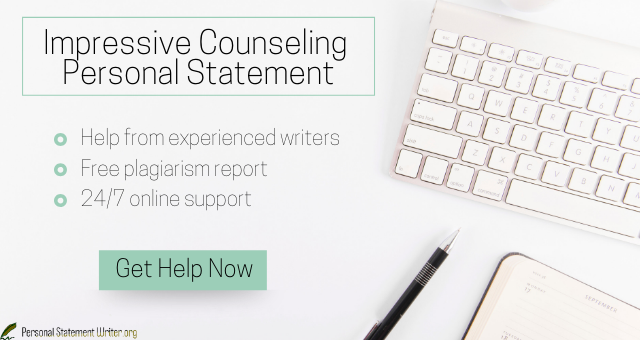 For the most engaging, successful counseling personal statement, contact us now and learn all the tricks.